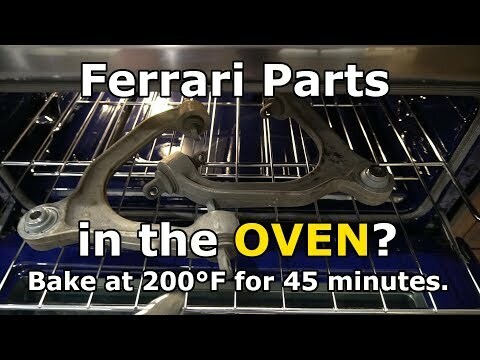 In this video I will show how to replace the upper ball joints on a Ferrari F430 or 360. The parts were all supplied from Ricambi America through my partnership with them and are listed above. If you need to purchase Ferrari or Maserati Parts, please contact Ricambi America. You will need to have some basic hand tools, floor jacks, c-clip pliers, a ball joint press, and an oven. Yes, you need to bake the ball joints to cure the Hysol glue once they are installed. Consider buying my sponsor’s stuff so I can keep doing this. Want to pay the Ferrari Tax? Use the coupon code “Ferrari Tax” on my website (http://www.normalguysupercar.com) and it will DOUBLE the cost of everything! Hello YT community! Thank you for the kind comments on this video. Partnering with Dan has been a treat, and we're anxious to see what projects he tackles next. We're excited to have him use parts from Ricambi America – and show everyone that indeed a normal guy (or gal!) can wrench on their own supercar. Congrats on the Ricambi partnership Dan! I've been watching your vids for a year now and have been looking at F430's for a few months. Checking for those loose taillights/mirrors, Sticky buttons, and everything else you've taught me, is quite helpful. Hope to get my 430 soon! A skilled mechanic you are! Dang 80 bucks for that little press tool. I guarantee I could do it with a couple of deep sockets, long bolt or threaded rod, some nuts and few fender washers. I pressed in the headset on the last bicycle I built using that method, instead of buying a $200 headset press. Worked perfectly. Those sorts of specialty tools if I can’t make something it would be nice if they would rent it out, since I likely wouldn’t need it again. The ball joints have no lube? Seems like the stainless would gall. Where is the Corvette? If I every get a F430 I’ll know how to do it. Thank heavens nothing went wrong. Would a shop put those in an oven? Why would they use the other type of ball joints? Awesome video.How do you like the garage flooring? Good one, Dan. I started watching your vids for the DIY on the 430 and this did not disappoint. Keep it up. Thanks for taking the time to film it. I know it can be a pain to do the work and film at the same time. the ease of doing that job, I'll put in new joints every year. Love Ricambi! You turned me on to them when I bought my car last summer, they have been stellar! Side note, do yourself a favor and get a quality set of c-clip pliers- those universal c-clip tools $uck! Great video, looking forward to more "tech tips"! DDE is in Texas make a video with them. Love the videos keep it up! another awesome video! show the control arm bushings and the clutch please!!!!!! I always thought ball joints on cars had grease within the rubbers…hmmmm. Great video. Easy walkthrough. Thanks Dan! Another entertaining video, Dan. Thanks. Can we see more of the dog, though? The dog rocks! Interesting video, you covered the whole gambit, the Ferrari, the wife, the fish tank, beer break, the dog, and the mosaic in the kitchen that held up your remodel.